A fresh pot of coffee was brewed. 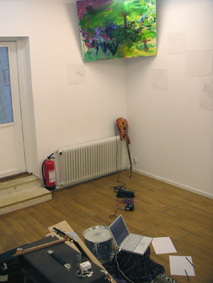 The portable CD-player was placed in the inner gallery space and hooked up to the small speakers. 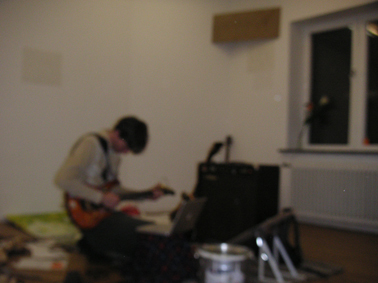 The four tracks which had been recorded in the gallery were played. 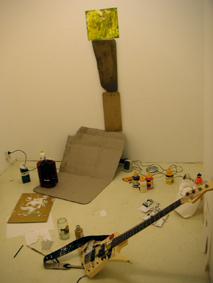 The bass guitar was plugged into the bass amplifier and taken into the inner gallery space, where it was placed leaning against one of the walls. 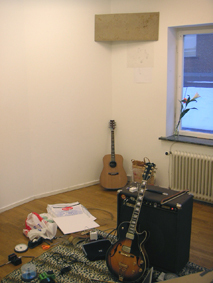 The paper cutout of a figure sitting on a blanket playing guitar was taken into the inner gallery space and placed on the floor by the bass guitar. The yellow painting was turned upside-down. 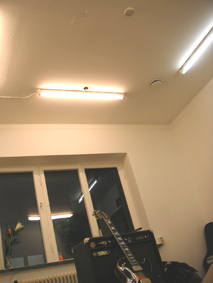 In the outer gallery space one of the electric guitars was also plugged into the bass amplifier and then placed in one of the corners, it's neck pointing downwards, resting on the floor. 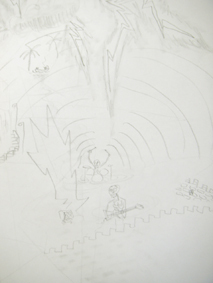 The painting of a tree was hung upside-down above the guitar, at an angle to the walls and the ceiling. A low hum could be heard from the amplifier. The painting of a pineforest was placed on the floor at a slight angle, leaning against the border of the wall. 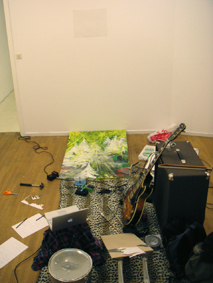 The laptop computer was placed on the drumkit and the sequence of photographs showing the fading of the coffee-painting was displayed on its screen. 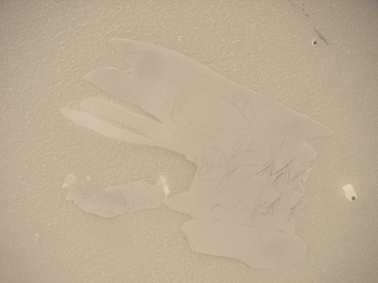 One of the drawings on the wall in the inner gallery space was taken down and three sections cut out. 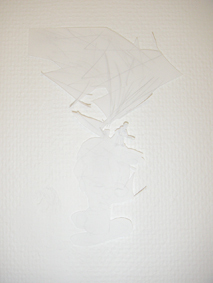 One cut-out section, of the head of a figure, was placed back on the wall. Another part, with a house on it, was placed on the ceiling in the outer gallery space, above the leopardskin-patterned blanket. 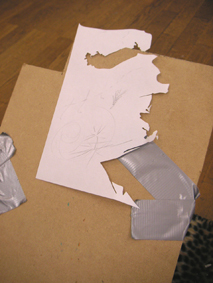 The third part, with a pine-tree on it, was placed on the sheet of wood which was part of the drum-kit. 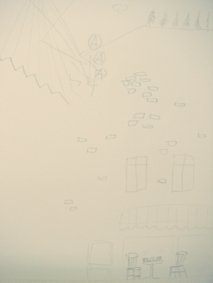 A drawing was made and placed high on the wall above the pineforest painting. 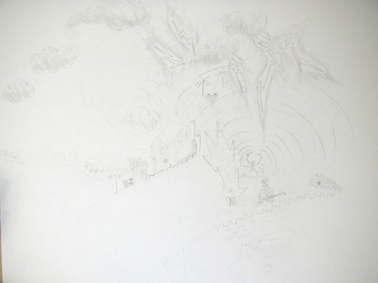 A drawing of some buildings, stormclouds and skeletons playing instruments was made. 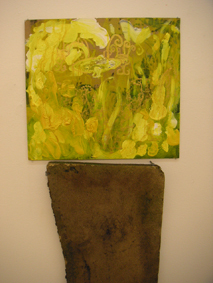 Another drawing, of a table with two coffeecups on it, was made and was attached to the wall facing the yellow painting in the inner gallery space. 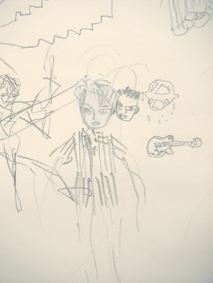 Yet another drawing, of a face and four anarchy-symbols, was made, and the head and symbols cut out. 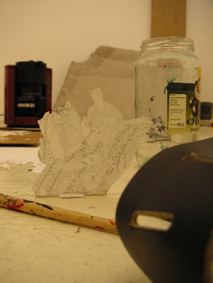 The face was placed over the face of another figure on the drawing which hung underneath the painting of the tree. 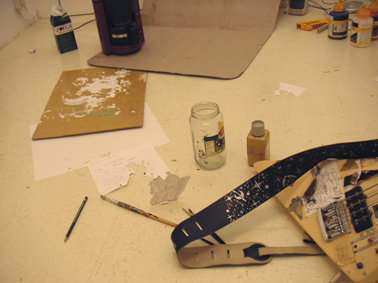 A piece of music was recorded using the bass guitar and electric guitar.